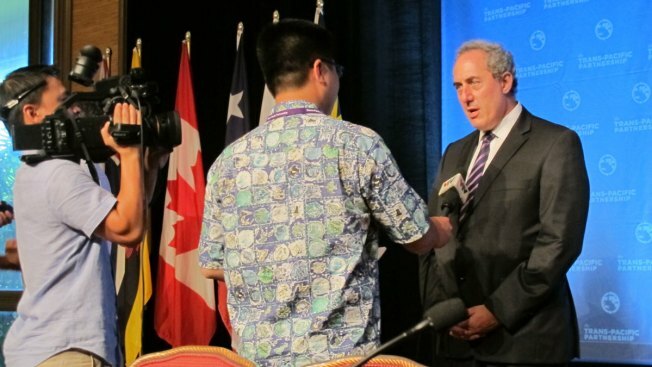 U.S. Trade Rep. Michael Froman responds to a television interview in Lahaina, Hawaii, Friday, July 31, 2015, after ministers from 12 nations negotiating a Pacific Rim trade pact said they made significant progress in reaching an agreement. Trade ministers from a dozen Pacific Rim nations failed to reach a deal on a new trade agreement that would cover nearly 40 percent of the global economy, U.S. Trade Representative Michael Froman said Friday. The countries haven't yet set a date for future talks. Froman said some issues were bilateral in nature, and some will involve groups. The talks have also covered establishing environmental protections for participant nations, which range from developing countries such as Vietnam to industrial powers such as Japan.